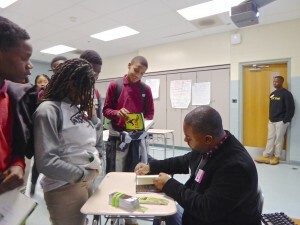 I recently had the privilege of visiting Kelly Miller Middle School in Washington, DC (before we in Virginia got slammed with snow and I got slammed with the flu) as part of An Open Book Foundation’s and We Need Diverse Books’ WNDB in the Classroom initiative. I met about 75 great kids and during our time together, they each participated in an activity that I call “Story Starters”. As a group, we came up with a couple of story prompts, and the kids then ran with the concept creating their own unique short story. I’m happy to debut one of those stories right here. This one is from Jasmine J., a promising writer/poet. Brenaeh never wanted to fall in love again, but the new kid would not be so kind. One day in class, at wonder view middle school. In Ms Honey’s class, Brenaeh was minding her own business doing her work. But then suddenly, there was a knock on the door and coming through the door was the new kid along with the principal at his side. Ms Honey said ” attention everyone, principal Luna has someone that she would like to introduce”. Principal Luna said ” thank you for your attention, good morning students”. The class said ” good morning principal Luna”. Principal Luna said ” well, everyone this is Mason and he is your new student in your class and I want everyone to be kind to him”. Copyright © 2015 Jasmine J. Thank you Jasmine for such great work! More story starters to come!